My key is broken and stuck inside the lock, what should I do now? If your car or house key is broken inside lock and not coming out do not make several effort or don’t prick things to bring the key out forcefully. You may end up making more damages to your ignition. 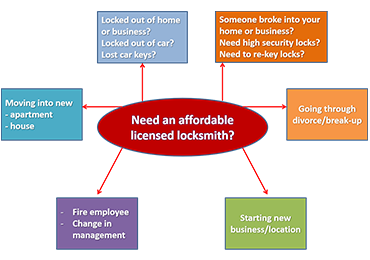 Call our 24/7 locksmith services for help. They can solve the problem in little time. Is there a chance of my car being damaged by a locksmith service? Our technicians are highly efficient and we use advanced technology and instruments tailored for unlocking your car lock without damaging your car. In most of the cases, we don’t leave a single scratch on your car. Anyway if the issue is too complicated it may do minor damage to your car. You are specialized with what sort of lock systems? Our team is specialized to work with almost every kind of key you may think. Along with automobile and building locks, we work with patio locks, mailbox locks, safes etc. We are experienced working with every brand available in markets. If you know the brand of your lock then inform while calling us. It fastens the process and makes it easier. I want a keyless locking system for my business security. 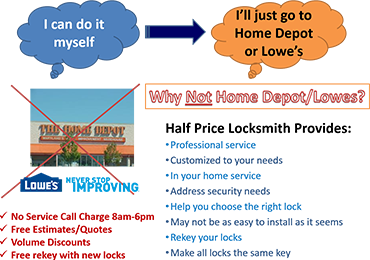 Is it possible for locksmiths to help me with what I require? If you want advanced keyless security system in your office, make sure you do it from a reputed locksmith only. Here in Half Price Locksmith we install high quality keyless locking system on your home or office door in an affordable price. To know if a keyless locking system is suitable for your requirement dial our toll free number for free expert advice. You can avail our service all around the clock. Our 24/7 Locked out service is there to assist you at any hour. No matter if it is midnight or Christmas vacation, you get us in your doorstep within thirty minutes you call, if not earlier. You can simply call us on the toll free number mentioned in this site or fill the on line form on the same site.